Profits set to soar in outer space. ↑ Chuss, D. T. (June 26, 2008), Cosmic Background Explorer, NASA Goddard Space Flight Center, archived from the original on May 9, 2013, retrieved 2013-04-27. 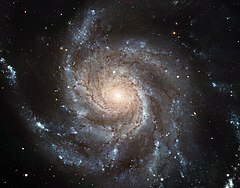 ↑ "Where does space begin? – Aerospace Engineering, Aviation News, Salary, Jobs and Museums". Aerospace Engineering, Aviation News, Salary, Jobs and Museums. Archived from the original on 2015-11-17. Retrieved 2015-11-10. ↑ Tadokoro, M. (1968), "A Study of the Local Group by Use of the Virial Theorem", Publications of the Astronomical Society of Japan, 20: 230, Bibcode:1968PASJ...20..230T. This source estimates a density of 7 × 10−29 g/cm3 for the Local Group. An atomic mass unit is 1.66 × 10−24 g, for roughly 40 atoms per cubic meter. ↑ Tyson, P. (January 2012), The Kinetic Atmosphere: Molecular Numbers (PDF), archived from the original (PDF) on 16 March 2014, retrieved 13 September 2013. ↑ Davies 1977, p. 93. ↑ Letessier-Selvon, A.; Stanev, T. (July 2011), "Ultrahigh energy cosmic rays", Reviews of Modern Physics, 83 (3): 907-942. ↑ Lide 1993, p. 11-217. ↑ Lizzie Schiffman (July 17, 2013), What Does Space Smell Like, Popular Science, archived from the original on February 24, 2014, retrieved February 19, 2014. ↑ Wielebinski, R.; Beck, R. (2010), "Cosmic Magnetic Fields − An Overview", in Block, David L.; Freeman, Kenneth C.; Puerari, Ivânio, Galaxies and their Masks: A Conference in Honour of K.C. Freeman, FRS, Springer Science & Business Media, pp. 67–82. ↑ Portree, D.; Loftus, J. (1999), Orbital Debris: A Chronology, NASA, p. 13, archived from the original (PDF) on 2000-09-01, retrieved 2012-05-05. ↑ Koskinen 2010, pp. 32, 42. ↑ Mendillo 2000, p. 275. ↑ "Geomagnetic Storms" (PDF), OECD/IFP Futures Project on "Future Global Shocks", CENTRA Technology, Inc., pp. 1–69, January 14, 2011, archived (PDF) from the original on March 14, 2012, retrieved 2012-04-07. ↑ Strickland, J. K. (October 1, 2012). "The cislunar gateway with no gate". The Space Review. Archived from the original on February 7, 2016. Retrieved 2016-02-10. ↑ Dickson 2010, p. 57. ↑ Abby Cessna (July 5, 2009), "Interplanetary space", Universe Today, archived from the original on March 19, 2015. ↑ Frisch et al. 2002, pp. 21-34. ↑ Papagiannis 1972, pp. 12–149. ↑ Flynn, G. J.; et al. (2003), "The Origin of Organic Matter in the Solar System: Evidence from the Interplanetary Dust Particles", in Norris, R.; Stootman, F., Bioastronomy 2002: Life Among the Stars, Proceedings of IAU Symposium #213, San Francisco: Astronomical Society of the Pacific, Bibcode:2004IAUS..213..275F. ↑ Leinert, C.; Grun, E. (1990), "Interplanetary Dust", Physics of the Inner Heliosphere I, Berlin, Germany: Springer-Verlag: 207, Bibcode:1990pihl.book..207L. ↑ Jia-Rui Cook (September 12, 2013), "How do we know when Voyager reaches interstellar space? ", JPL News, 2013-278, archived from the original on September 15, 2013. ↑ Ferrière, K. M. (2001), "The interstellar environment of our galaxy", Reviews of Modern Physics, 73 (4): 1031. ↑ Rauchfuss 2008, pp. 72–81. ↑ Wadsley, J. W.; et al. (August 20, 2002), "The Universe in Hot Gas", Astronomy Picture of the Day, NASA, archived from the original on June 9, 2009, retrieved 2009-06-19. ↑ Gupta, A.; Galeazzi, M.; Ursino, E. (May 2010), "Detection and Characterization of the Warm-Hot Intergalactic Medium", Bulletin of the American Astronomical Society, 41: 908. ↑ Fang, T.; et al. (2010), "Confirmation of X-Ray Absorption by Warm-Hot Intergalactic Medium in the Sculptor Wall", The Astrophysical Journal, 714 (2): 1715. ↑ Bykov, A. M.; Paerels, F. B. S.; Petrosian, V. (February 2008), "Equilibration Processes in the Warm-Hot Intergalactic Medium", Space Science Reviews, 134 (1–4): 141-153. ↑ Grant 1981, p. 10. ↑ O'Leary 2009, pp. 209–224. ↑ Landgraf, M.; et al. 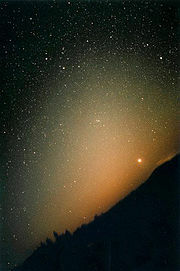 (February 2001), "IRSI/Darwin: peering through the interplanetary dust cloud", ESA Bulletin, (105): 60-63. ↑ Treaty on Principles Governing the Activities of States in the Exploration and Use of Outer Space, including the Moon and Other Celestial Bodies, United Nations Office for Outer Space Affairs, January 1, 2008, archived from the original on February 22, 2011, retrieved 2009-12-30. Borowitz, Sidney; Beiser, Arthur (1971), Essentials of physics: a text for students of science and engineering, Addison-Wesley series in physics (第2nd版), Addison-Wesley Publishing Company Note: this source gives a value of 2.7 × 1025 molecules per cubic meter. Davies, P. C. W. (1977), The physics of time asymmetry, University of California Press, ISBN 0-520-03247-0 Note: a light year is about 1013 km. Dickson, Paul (2010), A Dictionary of the Space Age, New Series in NASA History, JHU Press, ISBN 0801895049.